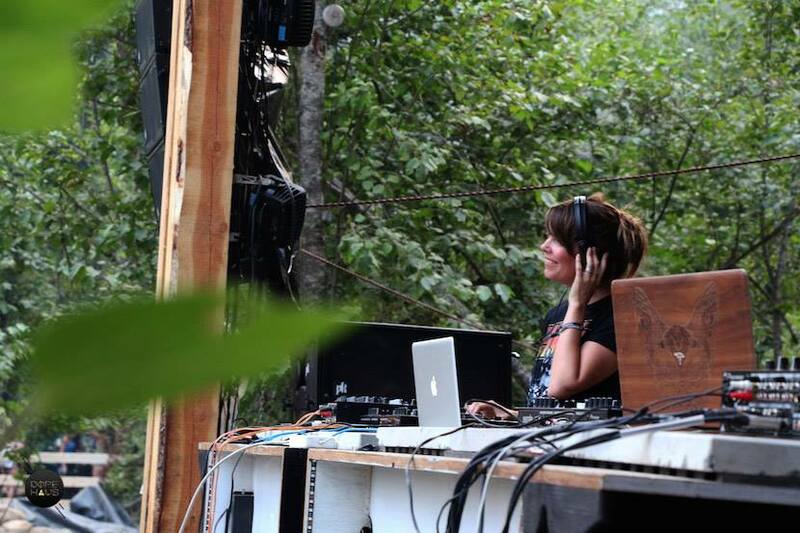 Shambhala’s long time Living Room stage director and former talent booker Sara Spicer lives and breathes music. 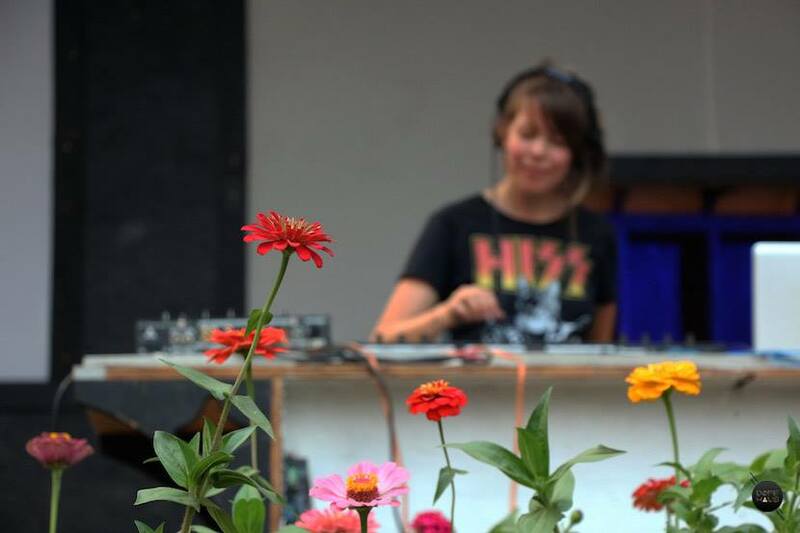 She reflects how far she’s come from collecting vinyl and running a record store in Halifax to opening for Dimond Saints in Vancouver under her DJ moniker Lion-S.
How did the Living Room stage start? 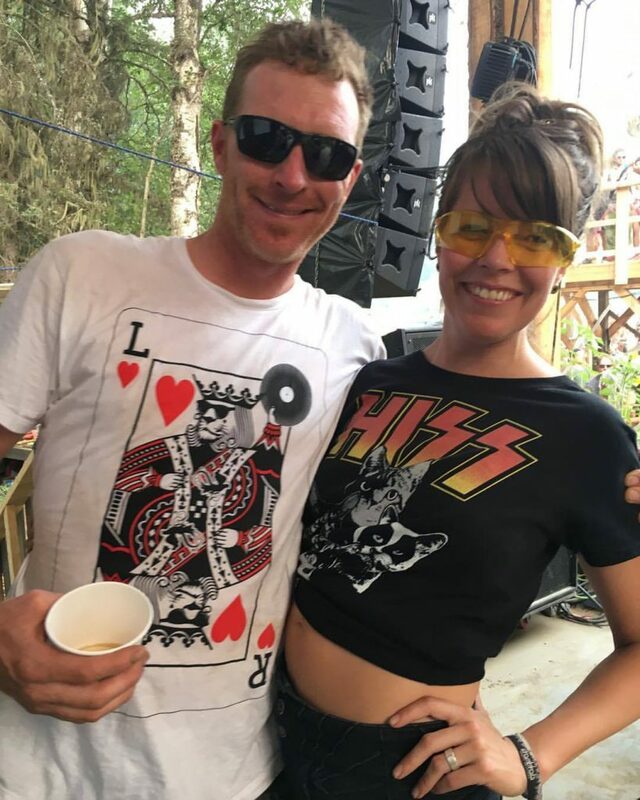 Sara takes us back through the “golden years” of Shambhala to see how the stage has evolved since its inception. 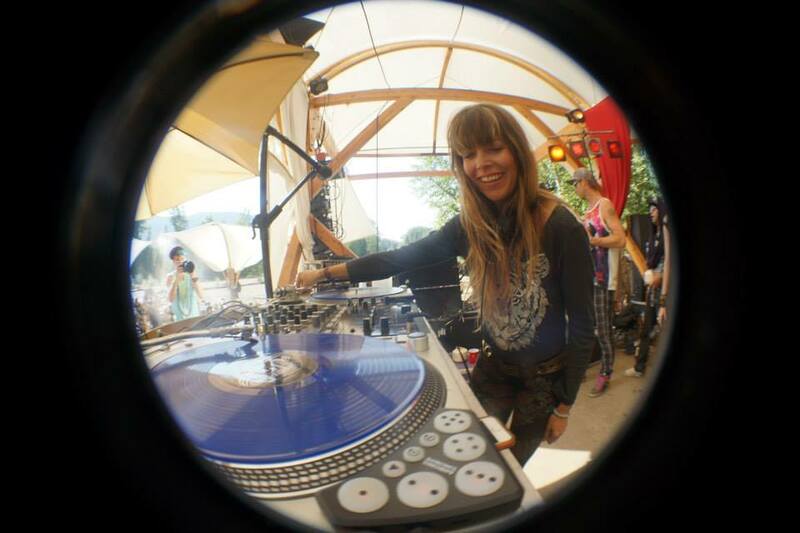 DOPE HAUS press correspondent Sophia Sengsuriya joins the leader of the “Pride” at Shambhala’s 20th anniversary. DOPE HAUS says: What’s new for 2017 at the Living Room? Lion-S says: We’re in a really big transformational year. We used to build a stage that was prefabricated and designed by a dear friend and engineer who was amazing. We decided we want to build a permanent structure. It was [festival founder] Jimmy Bundschuh, the farm boy, who decided to do that. The challenge has always been the river. It always changes the landscape. Every single year, we never know what’s going to happen with the runoff, but we made a plan and pulled it inland. 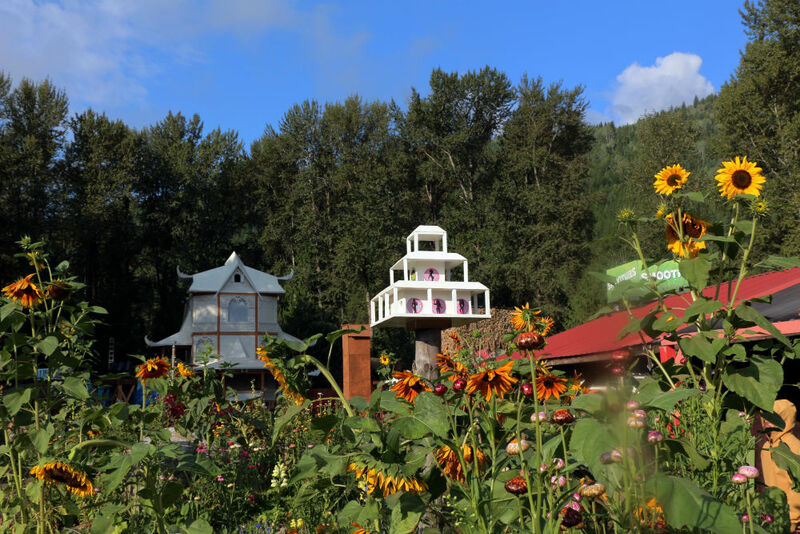 It’s a permanent house structure with two levels — that’s been our biggest change. Along with opening it all up. If you’ve been here a lot, you know the 2 large cedars are a real highlight of the stage. We’ve got aerial hoops rigged, all kinds of fun stuff happening. 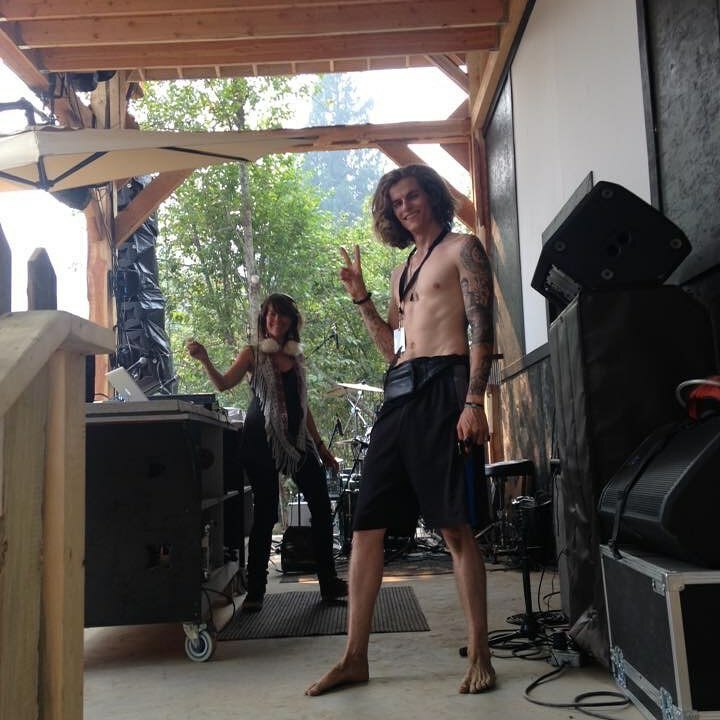 A merch booth, a little chill zone, a hammock zone, and lots of pathways and fun. DOPE HAUS: Every detail does matter. It creates a sense of place. Lion-S: The crew has been working very hard. It’s been a challenging year. The pond, not going to lie, was not our idea (laughs). We’ll make it better next year. It’s an interesting water feature. Everyone on our team has put so much blood, sweat and tears into the work because it was such a huge thing to do in a short amount of time. We didn’t have a foundation to the stage until two weeks ago. I’ve since then watch them erect all the buildings and everything. I’m happy. It’s awesome. It’s happening. It’s all worth it. DOPE HAUS: What’s the origin story of the Living Room? Lion-S: My husband and I have been involved with the festival, with a whole community of people since the beginning. We used to curate all the stages, the music. We did all the bookings from year 4 until end of year 10. Lion-S: We used to have a bpm rule, like no beats faster than 111, a lot of ambient formats, but then we were always competing with the big PK rigs on other stages so we’ve changed the programming a little bit. It’s still more like what you’d play in your living room. Each year, we stick to that vision and have support of the local scene a lot in Nelson. Plus, we get certain headliners we love. Lion-S: We’re bringing back that living room theme back. Living Room is this… whole area! We used to house a lot of internationals and they’re still there today. A lot of locals would camp here, so we consider this whole zone, this side of the farm the living room because people live here. There’s lots of lamps. We want to make it feel cosy. A place that people can get away from the full power stages and just really get grounded by the river and chill out. DOPE HAUS: Where does your alias, Lion-S come from? Lion-S: I can tell you my husband’s a Leo. I’m his polar opposite, I love Leos. My DJ name came about first in Halifax. I owned a record store. I collected vinyl in the 90s. I was into the dance culture and never thought I’d ever DJ. I collected a few of my favourites. I used to go to Basics in Vancouver and buy. I’d sing the chorus to a song and Tyler Stadius would point to where it is and I’d buy it, but I never intended on being a DJ. All my roommates were. But then I moved to Halifax and opened a record store and started collecting them at cost, and so one day someone asked me if I would play a party. We were promoters then still. I brought my friend Vinyl Ritchie out to Halifax, and he hadn’t seen me in a couple years. When he walked in, I had full dreadlocks (laughs). He goes, “Sara, you look like a lioness — that’s your DJ name!” I did the dash ’s’ because my name’s Sara Spicer. Lion-S: When we moved back to Nelson, we used to be the Vitamin Tribe out there. We were all about promoting healthy rave culture with super foods and staying hydrated. Having a competition with your buddies to stay sober all night and dance. We were really into that in our early 20s. That was where the Vitamin Tribe came from. It’s also connected with some roots of friends in Whistler. We made our own brand, The Pride, when we moved back to Nelson. We feel like the lions, the symbol of 2 lions and their pride, is like the family that chills out along the river here. You guys — everyone is part of the pride. It signifies family and loyalty. We’re proud of being about to host. I’m all about integrity and remaining committed. So when we work with artists, I love that aspect of being professional and operating from integrity. A lion to me signifies that. Does that make sense? Strength and power. It’s not an ego thing, it’s more about being proud of our family and loyalty and how it keeps growing. Everyone’s welcome to be a part of it. DOPE HAUS: Do you have any self care advice for people at festivals? Lion-S: I’m really glad you asked that because we consider the Living Room your self-care stop. We have a concession where we have replenishing drinks and coconut water. We do have the yerba mate drinks, too, that are a good alternative to other choices. Even being up all night dancing, you know, hard on our bodies, so it’s important to have repair. We have little packs that we sell to help people recover quickly. Aloe, cell renewal formula, and super foods. I’m all about reminding people to keep hydrated, take care of your friends. If you notice anyone’s burning out, go get educated at harm reduction! It’s a really important thing for people to do and hopefully make better choices. Lion-S: That’s at the center of my why for my life— self-care — and also helping artists get free so they can live and breathe their art. So, that’s important. Freedom, self-care. If we don’t take care of ourselves, what kind of life will we have? I don’t think it’s a selfish thing to model that, I obsess over making sure I eat every few hours, taking care of myself and checking in with my friends to make sure they’re doing the same. Keep up with the Living Room stage on Soundcloud, Twitter and Facebook. The Living Room is hosting SOOHAN with guests Barisone and S2 to Vancouver and Nelson at the beginning of Feburary 2018. Check the Facebook event for more details.